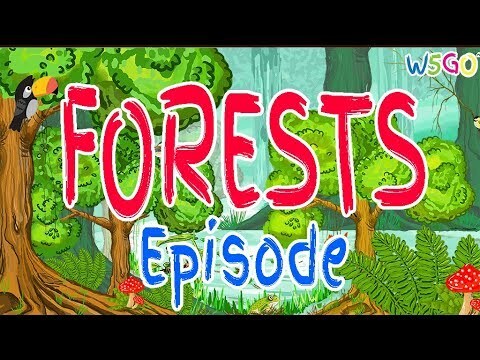 Venture into virtual forests, discovering what creates a forest, who lives in a forest, the sounds of a forest and the basics of photosynthesis. On this fun-filled adventure, you will use VR to discover the many different parts that make up a forest ecosystem. Identify seasons, trees and plants. Follow footprints to find out who makes them and what sounds they make. Watch and interact with the stages of photosynthesis, learn the importance of the process and how people benefit from this process. This App is designed for children in preschool. They are ad-free and doesn't contain in-app purchases. The www.w5go.com website and related apps (the “Site”) is developed and maintained by Ecocarrier Inc. (“W5GO or “We”) and is created as an educational platform for children. Illegal duplication, alteration, reselling, redistribution, or use in any separate project of any graphic, sound, video clips, or any other content found on the Site is strictly prohibited. It is up to the user to fully understand the risks of using the Internet and to be sufficiently aware of those risks to adequately protect your confidential information. The Internet can be a great place for kids to learn about topics that are of interest to them. However, there are areas on the Internet that are not appropriate for children. The most important thing is to be aware of what your children are doing online. Many Internet service providers (ISPs) provide parent-control options to block certain material from coming into a computer. You can also get software that helps block access to certain sites based on a "bad site" list that your ISP creates. Filtering programs can block sites from coming in and restrict personal information from being sent online. Other programs can monitor and track online activity. Parents should be aware that We are not responsible for any content from third-party websites (i.e., websites that we don’t have control over). See section on Third Party Sites, below. You are cautioned that any online communications may not be fully confidential. In addition, you should be aware that federal postal regulations do not protect electronic mail. You should be aware that some of our administrative personnel may, in the course of their regular duties, have access to communications for technical or operational purposes. We may also disclose any communications to the extent permitted or required by law. We make the Site available for users of all ages. However, users under the age of majority consent in their province or territory of residence (“Minors”) must take certain steps before they can access the Site. During the process of creating a www.w5go.com account, you will be asked to choose a username and to create a password in order for you to access the Site. We have put in place a number of procedures for children to access and use the Site safely. During the process of creating an account, you will be asked for your email address and to create a password and username. Children should choose a username that protects their real identity. Your www.w5go.com account(s) are for your personal use only. Please do not share your account details with any other person, as you will be held responsible for all activities that occur under your password or account(s) with or without your knowledge. By creating any type of account on www.w5go.com, you confirm that you will treat your login details as confidential. We will remove access to your www.w5go.com account if your parent has expressly refused or revoked their consent for you to use the Site. If we do so then you may not continue to use your account, create another www.w5go.com account or access or use the Site by any other means unless your parent or guardian provides their consent again or until you are no longer a Minor. We may withdraw or terminate your access to the Site for any other reason at our sole discretion. In connection with the use of the Site, you shall abide by all applicable federal, provincial, state or local laws, including those pertaining to such areas as libel, slander, defamation, trade libel, product disparagement, harassment, invasion of privacy, tort, obscenity, indecency, and copyright or trademark infringement. The Site contains material which is protected, nationally and internationally, by copyright and trademark laws. No material from the Site and no software (“Materials”) may be copied, reproduced, republished, uploaded, downloaded, transmitted or distributed in any way or decompiled, reverse engineered or disassembled, except that you may download one copy of only such Materials which is expressly so designated, and in such event, only on any single computer for your personal, non-commercial home use only, provided you keep intact any and all copyright and other proprietary notices. If you download software from the Site, the software, including any files and/or images incorporated in or generated by the software, is licensed to you by us. We do not transfer title to the software to you. You own the medium on which the software is recorded, but we retain full and complete title to the software and all intellectual property rights therein. You may not re-sell, decompile, reverse engineer or disassemble the software. You shall not post, transmit or make available in any way through the Site any software or other materials which contain a computer virus, trojan horse, timebomb, worm or other rogue programming ("Rogue Programming"). We have no obligation to detect the presence of any Rogue Programming. Any downloading of software or other Materials or any other use of the Site is at your risk, and you are advised to take adequate precautions to minimize any loss to your system caused by Rogue Programming, including the use of anti-virus programs and proper backup of files. We control and operate the Site from our offices within the Province of Ontario, Canada. We make no representation that materials in the Site are appropriate or available for use in other locations. Those who choose to access the Site from other locations do so on their own initiative and are responsible for compliance with local laws. Software from the Site is further subject to Canadian export controls. This agreement is effective until terminated by either party. You may terminate this agreement at any time by destroying all materials obtained from the Site and all copies and installations thereof. This agreement will terminate immediately without notice from us if, in our sole discretion, you fail to comply with any term or provision of this agreement. Upon termination, you must destroy all materials obtained from the Site and all copies thereof, whether made under the terms of this agreement or otherwise. We have the right at any time to change or discontinue any aspect or feature of the Site, including without limitation, content, availability, equipment required for access or use, or the application of subscription fees. We do not warrant or make any representations of any kind or nature with respect to the Materials. You are responsible for compliance with local laws, to the extent such laws are applicable. TO THE FULLEST EXTENT PERMISSIBLE PURSUANT TO APPLICABLE LAW, WE AND/OR ANY OTHER PARTY INVOLVED IN CREATING, PRODUCING OR DELIVERING THE SITE ARE NOT LIABLE FOR ANY DIRECT, INCIDENTIAL, CONSEQUENTIAL, INDIRECT OR PUNITIVE DAMAGES ARISING OUT OF YOUR ACCESS TO, OR USE OF, THE SITE. WITHOUT LIMITING THE FOREGOING, THE SITE IS PROVIDED ON AN "AS IS" BASIS WITHOUT WARRANTIES OF ANY KIND, EITHER EXPRESS OR IMPLIED, INCLUDING WITHOUT LIMITATION WARRANTIES OF TITLE, NONINFRINGEMENT, OR IMPLIED WARRANTIES OF MERCHANTABILITY OR FITNESS FOR A PARTICULAR PURPOSE. WE DO NOT WARRANT THAT ANY INFORMATION IS COMPLETE OR ACCURATE, THAT THE SITE WILL BE UNINTERRUPTED OR ERROR FREE OR THAT ANY INFORMATION IS FREE OF ROGUE PROGRAMMING. UNDER NO CIRCUMSTANCES, INCLUDING NEGLIGENCE, SHALL WE BE LIABLE FOR ANY DIRECT, INDIRECT, INCIDENTAL, SPECIAL, PUNITIVE OR CONSEQUENTIAL DAMAGES THAT MAY RESULT FROM THE USE OR INABILITY TO USE THE SITE, INCLUDING WITHOUT LIMITATION USE OF OR RELIANCE ON INFORMATION AVAILABLE ON THE SITE, INTERRUPTIONS, ERRORS, DEFECTS, MISTAKES, OMISSIONS, DELETIONS OF FILES, DELAYS IN OPERATION OR TRANSMISSION, NONDELIVERY OF INFORMATION, DISCLOSURE OF COMMUNICATIONS, OR ANY OTHER FAILURE OF PERFORMANCE. YOU HEREBY RELEASE AND WAIVE ANY AND ALL CLAIMS AND/OR LIABILITY AGAINST US AND ALL OF OUR AFFILIATES, EMPLOYEES, DIRECTORS AND SHAREHOLDERS ARISING FROM OR IN CONNECTION WITH YOUR USE OF THE SITE. YOU ALSO AGREE TO DEFEND, INDEMNIFY AND HOLD HARMLESS, W5GO AND ALL OF OUR AFFILIATES, EMPLOYEES, DIRECTORS AND SHAREHOLDERS FROM AND AGAINST, ANY AND ALL CLAIMS OR LIABILITY, INCLUDING COSTS AND ATTORNEYS FEES, ARISING FROM OR IN CONNECTION WITH YOUR USE OF THE SITE OR FAILURE TO ABIDE BY APPLICABLE LAW. Applicable law may not allow the limitation or exclusion of liability or incidental or exclusion of liability or incidental or consequential damages and so the above limitation or exclusion may not apply to you. In no event shall our total liability to you if any for all damages, losses, and causes of action or otherwise exceed the amount paid by you, if any, for accessing the Site. We may provide links to Internet website maintained by others (“third party sites”). We have not reviewed all of the third party sites that may be linked to the Site and are not responsible for the content of or any products or services offered in such third party sites. If W5GO, or substantially all of its assets, were acquired, user information would be one of the assets that are transferred. W5GO will not provide Your email address to a third party without Your explicit permission. On the registration page, there is a prominently displayed method to indicate to us that You do or do not want to receive promotional and/or marketing information about products and services. User consent to use personal information can be withdrawn by emailing us at support@w5go.com and/or follow the instructions contained in the unwanted email message. However, in all cases, You will continue to receive all system emails such as those regarding forgotten user passwords and legal notices such as updates to policies from W5GO.